With the new year upon us, getting organized in 2017 is a great resolution. We know that can seem a daunting task – you’ve yet to put up all the gifts and decorations from the holidays, laundry and dishes have piled up, there’s paperwork to sort through, donations to drop off… the list goes on and on. The good news is getting organized in 2017 can happen as long as you remind yourself it doesn’t have to all happen at once. Follow these tips and tricks for a decluttered life and you’ll find yourself staying on top of the beautiful mess we call life. It can all be too overwhelming getting organized in 2017- you look at the pile of mess and think, “Where do I even start?”. Start in the area of your home you spend the most time in. Do you love to cook? The kitchen’s the place to be. 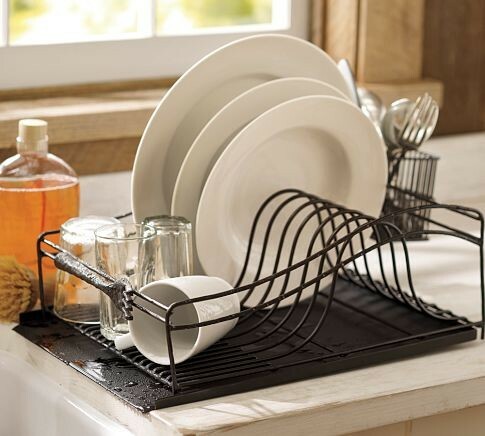 Start by putting away the dishes left drying on the rack. That makes room to next wash any plates or casserole dishes left lying about. That helps to clear off the countertops. Take it in small batches by cleaning off one countertop area at a time. Put items away into cabinets and drawers where they belong. Wipe the countertops down with your favorite cleaner and set out any decorative pieces you like to show off. Set a timer and take a one minute break when you have completed one small area. Remember, you don’t have to clean the whole kitchen at once; stay focused on one area at a time to avoid distraction from other messes. Now you’ve got a tidy and clean kitchen. Apply those same principles of tackling one small surface at a time in the other rooms of your home. Slow and steady wins the race! Remember, this is a whole year goal. 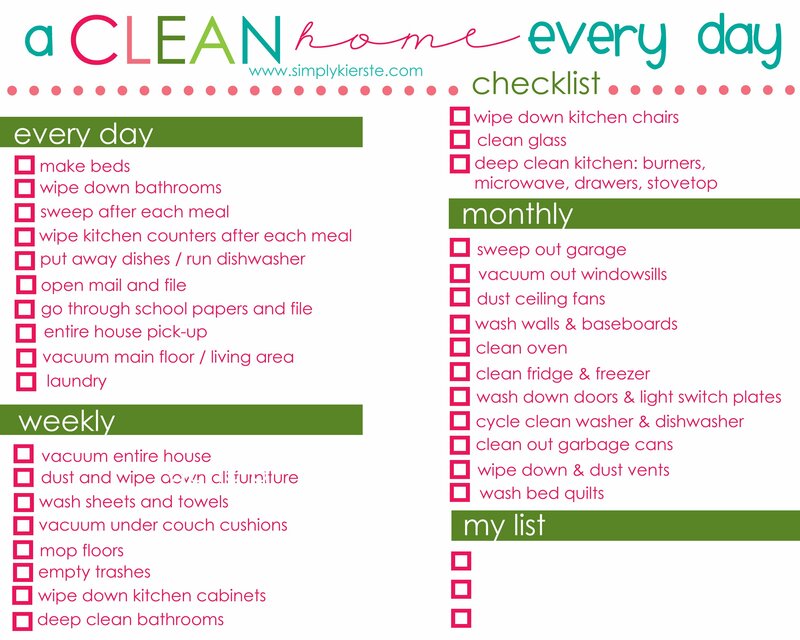 Don’t feel pressure to clean the whole house in one weekend. Set achievable goals with time and space. Have family coming over? Tidy up the living room in an hour or two. Close the doors to rooms still untidy and tackle them at a later date. Most people will respect a closed door and will not venture into areas you want off-limits. No two people are alike, therefore no two cleaning schedules are alike. Adapt and alter the examples above to what works best for you. Do you have a set dinner date every week? Skip that day on the cleaning schedule so you can enjoy your date night. Add packing a gym bag to the previous day’s list of to-dos so you’ve got everything you need ahead of time. 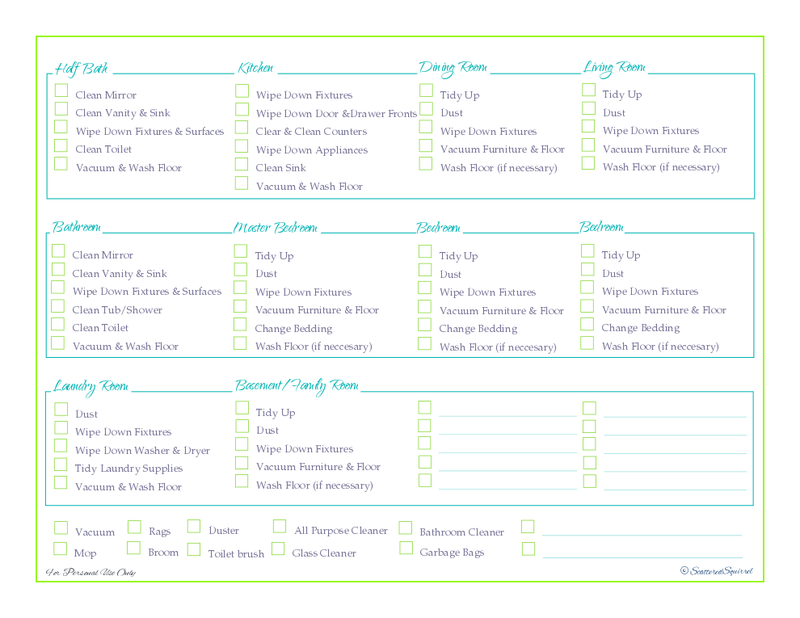 If you’ve got an extra pair of hands helping you, assign them achievable chores of their own to lighten your load. If you find you’re more productive during a particular time of day, utilize those hours to achieve your goals. If you’re an early riser, get up out of bed and tackle a few items on that day’s list rather than hitting the snooze button or plopping down on the couch. If you’re rushing out the door in the mornings, just be sure to toss your dirty clothes in the hamper rather than piling them on the floor. Take 30 seconds to make the bed. Those few extra steps in the morning will save you time after work and on the weekends from having to pick up and then clean up the mess. If you’re most productive at night, go through the day’s mail and leave any items to be mailed the next morning near your keys. Get the noisy items, like vacuuming or mowing done before sunset so you don’t disturb your neighbors and your not revving your heart rate up before trying to go to bed. Be sure to reward yourself when you finish the day’s tasks. Eventually these things will become habit and chores will transform from a to-do list to an already-done list. Getting and staying organized is a lot of work – no one said it would be easy. These tips and tricks are a good place to start to find balance in the day-to-day hustle and bustle. Remember to start small and tackle only what you can. Be forgiving with yourself in knowing you won’t be perfect all of the time, because you won’t be. Set reasonable time frames and only add to the list when you’ve really got a handle on the tasks your currently doing. Most of all, realize it’s okay because almost all of us have mess. Getting organized in 2017 is possible!